As The Dayton Art Institute prepares to begin its centennial celebrations in 2019, the museum has announced a suite of exhibitions for the year. 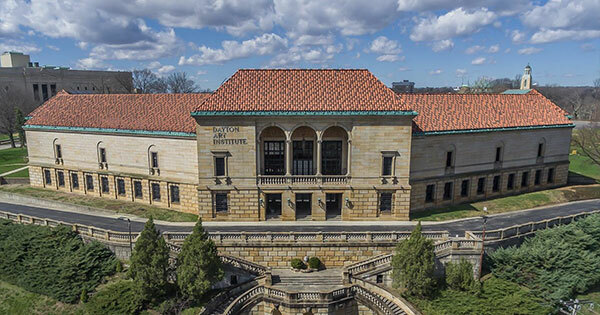 The Dayton Art Institute prepares to begin its centennial celebrations in 2019, the museum has announced a suite of exhibitions for the year. The centennial year will feature three special exhibitions, several “focus exhibitions” that highlight specific artists, works or themes, and two significant Asian art loans. The special exhibition season begins with For America: Paintings from the National Academy, on view February 23–June 2, and continues with Our Century: Dayton Area Collects, June 29–September 22, and Maker & Muse: Women and Early 20th-Century Art Jewelry, October 25, 2019–January 19, 2020. Focus exhibitions planned for 2019 include Dorothy Height’s Hats, March 23–June 23, Monet and Impressionism, May 11–August 25, The Moon Museum, June 29–September 8, William Preston Mayfield Photographs, September 21–December 29, Mona Lisa Today and In the Company of Friends: The Legacy of Kettering and Patterson, scheduled for early 2019, and Art of Ernest Blumenschein, scheduled for late 2019. Organized by The Dayton Art Institute, Our Century: Dayton Area Collects will bring together works from the most significant private art collections in the Dayton region, shown alongside significant gifts as part of the museum’s centennial celebrations, as well as future, or promised, gifts to The DAI. Featuring a diverse range of objects, the exhibition will look at the important role collectors play in helping to grow The DAI, through the past century and into the next. The DAI will be the exclusive Ohio venue for this traveling exhibition, organized by The Richard H. Driehaus Museum and toured by International Arts and Artists, Washington, D.C. Maker & Muse showcases the world of art jewelry at the turn of the twentieth century, featuring the Art Nouveau styles of France, Germany and Austria, and the Arts and Crafts movement in Britain and America, including works from the Louis Comfort Tiffany Studios, New York. The exhibition will feature more than 240 extraordinary examples of jewelry, looking specifically at the important roles women played in the creation and wearing of art jewelry, as both maker and muse. In addition to the slate of special exhibitions, The DAI will present a series of smaller focus exhibitions, highlighting a diverse range of art. The first of the focus exhibitions is Dorothy Height’s Hats, on view March 23–June 23. An author and icon of civil rights, Dorothy Irene Height (1912–2010) was known for her intelligence, leadership, courage … and hats! She was rarely seen in public without a hat, and this exhibition will explore the extraordinary life of Dr. Height by bringing together 42 of her favorite hats, on loan from The Dorothy I. Height Education Foundation, Washington, D.C.
Monet and Impressionism, May 11–August 25, will feature a dozen examples of Impressionist art. The exhibition, organized by The Dayton Art Institute, will provide a spotlight on Impressionism in France and Claude Monet’s remarkable influence on art. The focal point of the exhibition will be a special loan from the Denver Art Museum of Monet’s spectacular painting, Waterloo Bridge (Effect de soleil), 1903. This work demonstrates Monet’s tireless explorations of atmosphere and light. Additional loans will include works by Edgar Degas, Camille Pissarro, Pierre Auguste Renoir, Alfred Sisley, Frederick Frieseke, and Henri Matisse. The exhibition will also include examples of Impressionist painting from The DAI collection, including Monet’s Waterlilies, 1903, and the rarely shown Degas pastel, After the Bath, around 1895. The Moon Museum, June 29–September 8, will celebrate the 50th anniversary of the Apollo moon landing, by showcasing the strange and intriguing story of the Moon Museum. Featuring designs by six artists, including Andy Warhol, Claes Oldenburg, and Robert Rauschenberg, the Moon Museum is a tiny wafer, made in a small edition, one of which is believed to have traveled on Apollo 12 to the moon, where it remains. Featured on the PBS series History Detectives, the Moon Museum is a compelling story that crosses art and space. The exhibition will also include other works of art relating to the moon and the Apollo missions. During the latter half of 2019, a pioneering Dayton photographer will be featured in William Preston Mayfield Photographs, September 21–December 29. Mayfield (1896–1974) was a prominent figure in the history of Dayton photography and among the first to take photos from an airplane. Drawn from a private collection, this exhibition will showcase Mayfield’s many photographic achievements in and around Dayton during his six-decade career. Dates are still being finalized for additional focus exhibitions, including: Mona Lisa Today and In the Company of Friends: The Legacy of Kettering and Patterson, to be presented in early 2019, and Art of Ernest Blumenschein, to be presented in late 2019. The Mona Lisa by Leonardo da Vinci (1452–1519), is a pinnacle of achievement of the Italian Renaissance and the most famous painting in the world. Although instantly recognizable today, the painting actually looks considerably different than it would have when created in 1503. Colors have faded and changed with time and details are now lost, but recent scientific studies indicate how the painting would have appeared when still fresh from Leonardo’s easel. Using the extensive data compiled by a team of experts from the Louvre, Paris, and after her own research, artist Jenness Cortez (American, born 1944) was commissioned to paint a modern-day reproduction that shows the vibrant colors and fresh details of the original. The presentation of this modern reproduction of the Mona Lisa will not only celebrate The Dayton Art Institute’s centennial, but also the 500th anniversary of Leonardo’s death in 1519. In the Company of Friends: The Legacy of Kettering and Patterson celebrates 100 years of collecting Asian art at The DAI by exploring the significant contributions of Virginia W. Kettering and Jefferson Patterson to the collection. Presenting a variety of artworks on the topic of the Chinese scholar-collector, the exhibition will pose the broader question of what it means to collect. Raised in Dayton, Ernest Blumenschein (1874–1960) was a highly successful artist and co-founder of the influential Taos art colony, in Taos, New Mexico. Joining The DAI’s painting Canyon, Red and Black (1934) will be a handful of other works by the artist, including a special loan of Eagle Wing Fan (1920s) from the Philbrook Museum in Tulsa, Oklahoma. In addition, the current focus exhibition Impressive: 100 Years of Japanese Prints at The DAI, will continue throughout the centennial. It traces the development of The DAI’s extensive Japanese woodblock print collection and the donors who helped shape it. Including works from some of the most famous artists and examples of the typical genres, the exhibition will feature rotations of different prints every four months. Two significant art loans will also be on view beginning in early 2019, further enhancing the museum’s rich Asian art galleries. The first, a stone sculpture from ancient Gandhara, is outstanding for its monumental size and sensitive carving. The second is an ancient Chinese bronze vessel distinguished by well-preserved decoration, especially of the dramatic taotie masks. A museum membership is the best way to experience everything happening during The DAI’s centennial. Starting as low as $40, a one-year membership provides free admission to all exhibitions and the museum’s collection galleries, as well as free admission to Bob Ross Auto Group Jazz & Beyond concerts, free or discounted admission for many other museum events, programs and workshops, discounts at The Museum Store and Leo Bistro, and reciprocal admission to 14 other Ohio art museums. On Saturdays during the month of December, the museum is offering a 25% discount on the purchase of new or gift memberships. The discount is available online, by phone at 937-223-4ART (4278), or in person at the museum’s Guest Services Desk, but only on Saturdays in December. A membership purchased in December also includes free admission to the museum’s current special exhibition, Muse: Mickalene Thomas Photographs and tête-à-tête, which continues through January 13, 2019.